Chaos reigns supreme on the streets of Galle and it takes some serious maneuvering by our tuk tuk driver as we head out of the city. Our destination was the Handunugoda Tea Factory. Galle is situated in the Southern part of the island nation on the coast. We had never heard of white tea and it was hard to imagine tea growing near the seaside so this was a place we were eager to see. 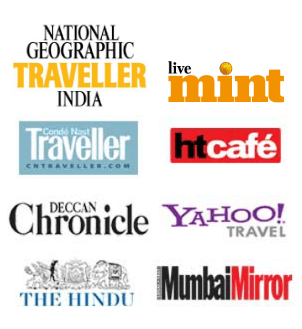 For most part, the tumultuous Indian Ocean kept us company. Deserted palm fringed beaches appeared every now and then, as did memorials made for those who lost their lives in the devastating tsunami of 2004. Our tuk tuk driver shared tales of the tsunami and the destruction it caused, even telling us about an entire train that was flung far away from the tracks by the gigantic wave. We drove past Hikkaduwa a beach famous with backpackers and Koggala – famous for stilt fishermen. It was a glorious sunny day and the drive was scenic and lovely. The image I have of tea plantations is that of hillsides covered with dense bushes of tea, dotted by eucalyptus trees. There were no hills in sight and it was hard to imagine a tea garden besides the ocean, especially one that produces one of the most expensive teas in the world – completely untouched by hand. 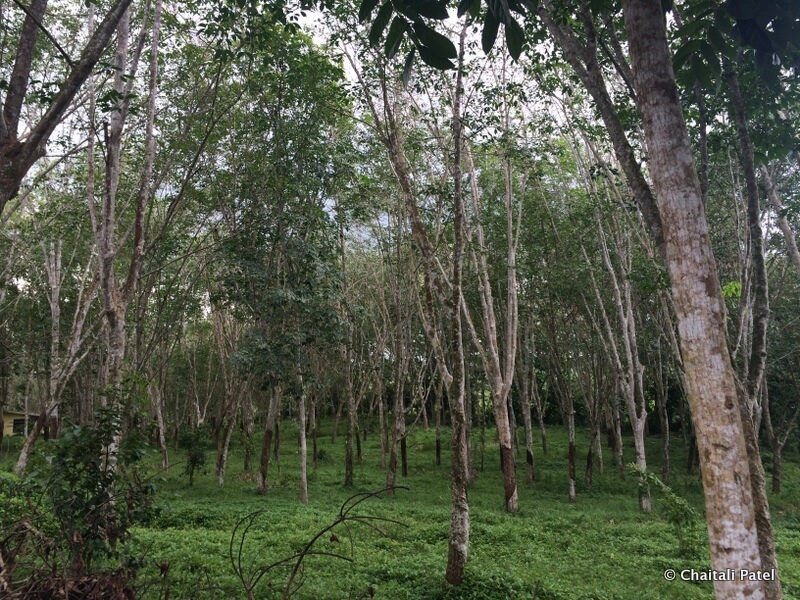 Soon we took a left off the main road into small villages and past lush fields until we finally arrived at our destination. 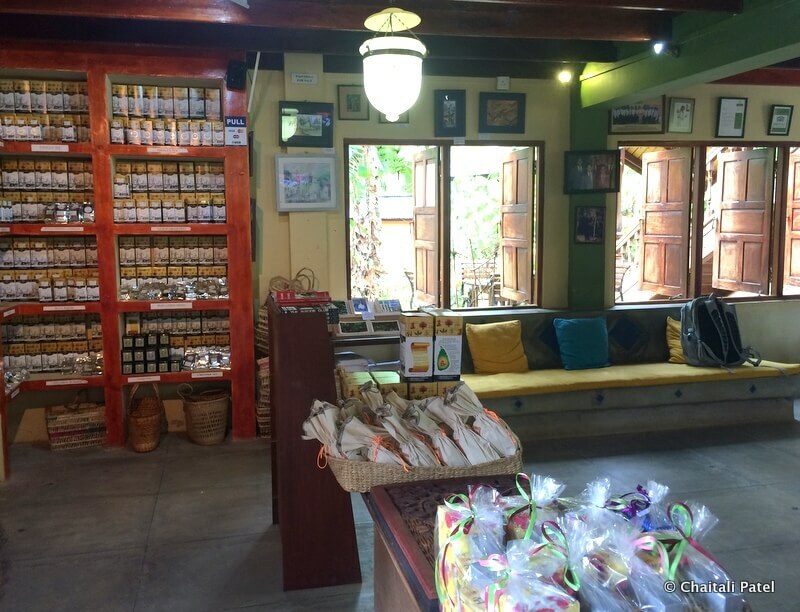 We were visiting the Virgin White Tea Factory at the recommendation of Juliet Coombe – an author and journalist based in Galle. Juliet knew Herman Gunaratne – the founder and owner of the factory and promised us it would be more than worth our while. As the tuk tuk driver dropped us off an elderly man came and welcomed us. He was a resident tea planter and he was to show us around, as Herman was away on some work. So off we went on our private tour of the famous Virgin White Tea Factory. The speciality of virgin white tea is that its completely untouched by hand. It follows an ancient Chinese ritual where mandarins employed virgins to cut the leaves with golden scissors and collect the same into a golden bowl. The first contact the tea had with human touch was when the emperor takes a sip. White tea is also popular because it has a very high percentage of antioxidants – 10.11%, one of the highest found in any beverage. The tea is thus said to be a rejuvenator and health giver. Handunugoda follows the same principle and the tea produced on the estate is untouched by hand but those who pluck it need not necessarily be virgins. Golden scissors and bowls are also no longer used. Women wearing masks and gloves use sterilized scissors to cut the tea leaves. 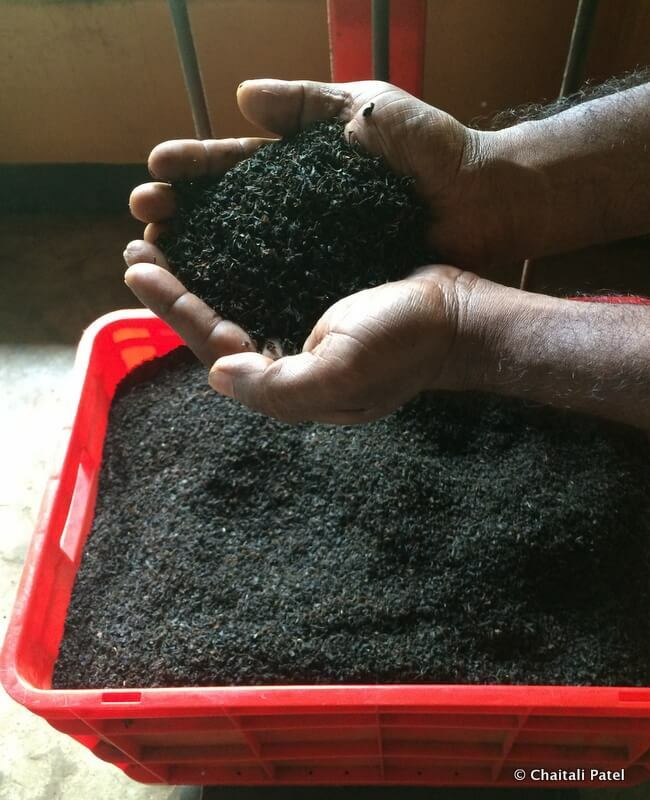 As strict quality standards are adhered too, only a small quantity of tea, about 10 kgs a month is produced. But the tea produced in sold at a whopping $1600 per kg and is exclusively bought by Mariage Freres, one of the most renowned tea salons based in Paris. 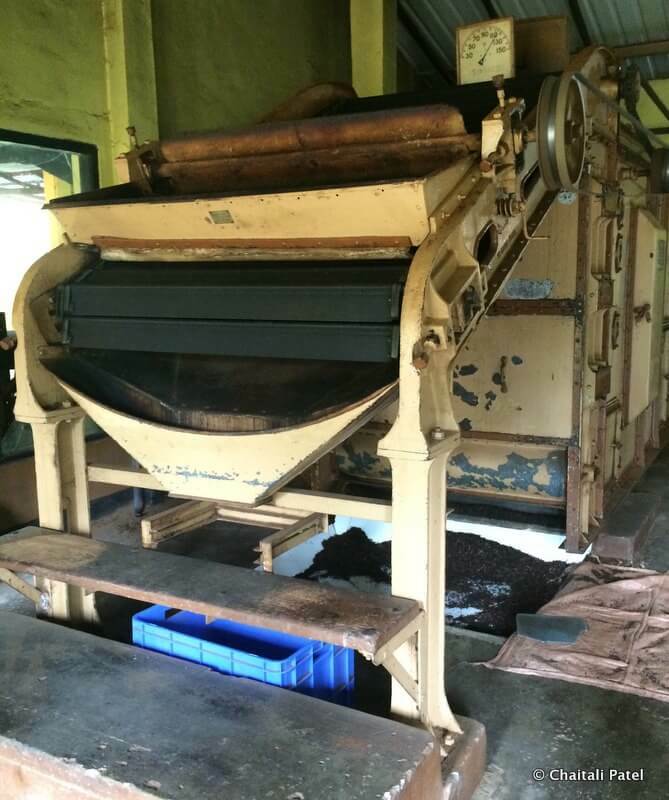 140 Year old machines are still in use at the factory. Some of which have been manufactured by the same company who made the Titanic in Belfast. The tour ended with a visit to a little museum and shop. 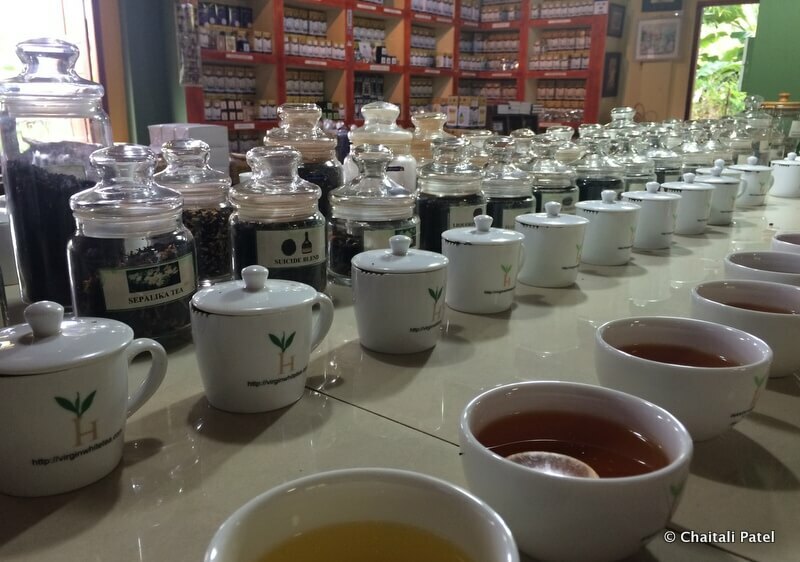 The museum has many different varieties of tea on display and the fun part is that you can taste how many ever who want. What also stood out is that the entire visit is free and at the end there is no compulsion to buy any of the products on display. Such is the exclusivity of virgin white tea that none of it is available for sale even in the factory, the entire produce is sent straight to Paris. 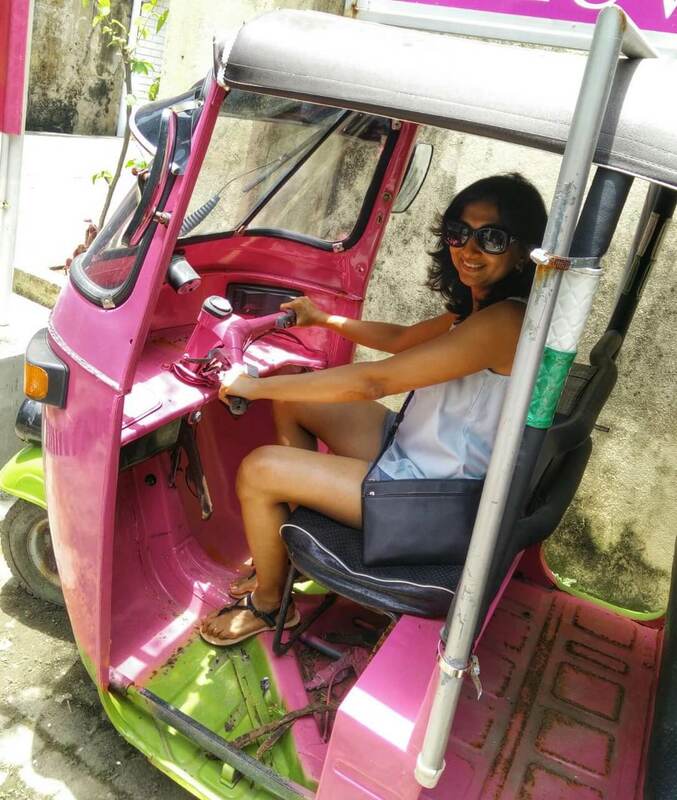 We took a tuk tuk from outside our hotel in Galle Fort to take us to the factory and back. There’s no transportation available outside the factory so its best you ask your tuk tuk or cab to wait at the factory. There is parking available inside the premises. 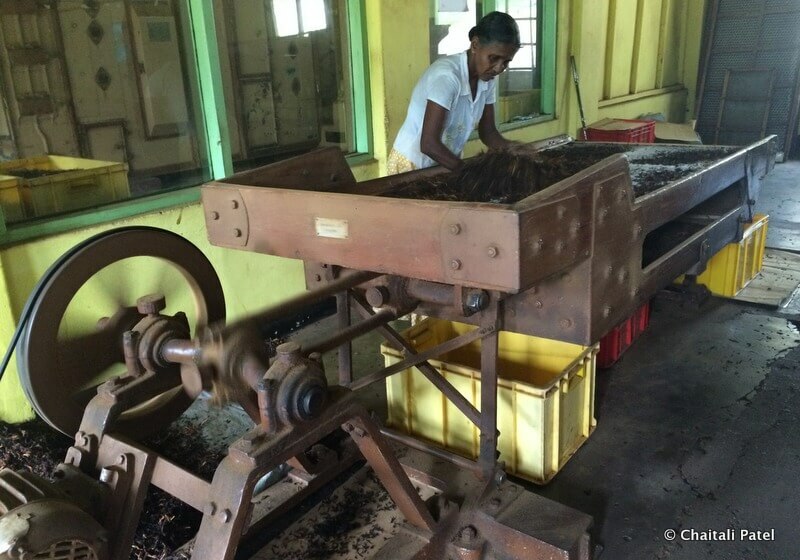 It took us about 45 minutes to get to the factory from Galle Fort and the tour typically lasts about an hour. We took our 3 1/2 year old daughter with us. She thoroughly enjoyed the tuk tuk ride to the factory and actually seeing the workers pluck tea and watch rubber being collected. She enjoyed the factory visit too. As we went mid morning it was really hot, so carrying a cap was very useful. Also wear comfortable walking shoes. There’s no restaurant on the premises so its best you carry a snack and some water with you. Hearing about the virgin white tea for the first time from your post.Thanks for sharing your experience.